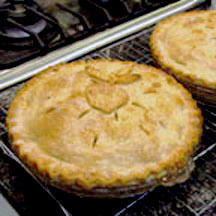 "For the best apple pie, the crust must be as delicious as the filling—and always use tart green apples. Granny Smith apples are a good choice, but my personal preference is Pippin. Granny Smith apples are a good choice, but my personal preference is the Pippin—and yes, I made the pie in the photograph." - Hope Pryor, owner of CooksRecipes.com. For Crust: Mix flour and salt in mixing bowl. Cut shortening into the flour with a pastry cutter, until mixture resembles tiny split peas. Add the ice water and mix in using a fork. Gather the dough into a ball. Divide dough into two balls and flatten each into 4-inch-wide disk. Roll one dough disk on a lightly floured surface into about a 12-inch circle and place into an ungreased 9-inch regular or deep-dish pie plate. Gently press dough into pie plate, leaving the portion that overhangs edge of pie pan in place. Refrigerate while preparing apple filling. For Filling: Peel, core, and cut apples into 1/4 to 1/3-inch thick slices. Gently toss apple slices with the lemon juice. In a small bowl, mix together the sugar, flour, cinnamon and salt. Add sugar mixture to the apple slices and gently toss to coat well. Turn apple mixture into into chilled pie crust and mound slightly in center. Dot with butter. Roll out second dough disk and place over filling. Trim overhang to 1-inch from edge. Tuck this rim of dough underneath itself so that folded edge is flush with pan edge. Flute edging or press with fork tines to seal. Make several slits in top crust to allow steam to escape. For Finishing Touches: If desired, brush egg white onto top of crust and sprinkle evenly with sugar. Bake pie at 425°F (220°C) on center rack in oven until crust is golden, about 25 minutes and then reduce oven temperature to 375°F (190°C); continue baking until juice bubbles and crust is a nice golden brown, about 30 to 35 minutes longer. Transfer pie to wire rack; cool to room temperature before slicing to serve, about 3 to 4 hours. *For best results, always use a premium brand of shortening such as Crisco. **During winter months, flour can become "drier", you may need to add more water, about 1 teaspoon or so, but not much more. Apple Pie with Crystallized Ginger: Follow recipe for Apple Pie, adding 3 tablespoons chopped crystallized ginger to apple mixture. Apple Pie with Dried Fruit: Macerate 1 cup raisins, dried sweet cherries, or dried cranberries in the lemon juice and 1 tablespoon Apple Jack, brandy, or cognac. Follow recipe for Apple Pie, adding macerated dried fruit and liquid to apple mixture. Apple Pie with Fresh Cranberries: Follow recipe for Apple Pie, increasing sugar to 1 1/2 cups and adding 1 cup fresh or frozen cranberries to apple mixture. Nutritional Information Per Serving (1/8 of recipe): 653.9 calories; 39% calories from fat; 29.3g total fat; 7.6mg cholesterol; 263.6mg sodium; 266.9mg potassium; 96.1g carbohydrates; 4.4g fiber; 54.9g sugar; 91.7g net carbs; 5.8g protein.